IGT is an online slots developer with a history of historically themed games and with Treasures of Troy it has continued that theme. 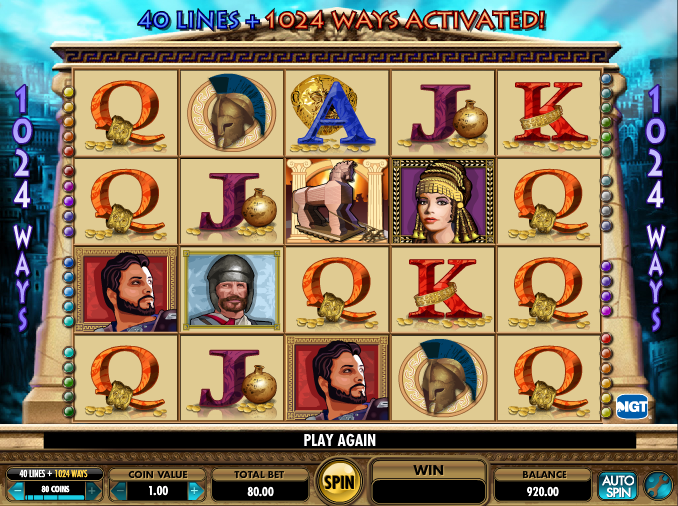 If you’ve played Cleopatra or Crown of Egypt you’ll probably already be familiar with IGT’s style of slot but this is a new game with some nice graphics and well worth trying out. There’s a brief voiceover at the start and some battle-like noises as you play this game. Troy was a real city set in what is now Turkey and probably most famous as the setting for the Trojan Wars, brought to life in Homer’s Iliad. It has five reels and 1024 ways to win and this slot is set against the backdrop of a vast metropolis beneath a blue sky. Four symbols are available on the reels here, not the usual three we normally see. The main symbols are characters from the narrative; we can guess at names such as Helen, Paris and Achilles. Other symbols are a sword and a helmet plus J, Q, K and A for the less valuable ones. The Treasures of Troy logo is the wild symbol while the famous wooden horse is the scatter symbol which activates the bonus game. IGT gives you the option to pay a little extra on top of your stake and opt for the Multiway, 1024 paylines. This effectively means that you will win create a winning combo if there are matching symbols in adjacent reels – payline patterns are not necessary. If you don’t want this feature you can opt for one, ten, twenty or forty paylines and pay proportionately less. You should also be aware that although you will win more often with the Multiway activated, the prizes will be smaller. Two, three or four of the wooden horse symbols landing on the centre reel will reward you with ten, fifteen or twenty free spins. You will notice the reels change colour when playing the free spins and landing more wooden horses on the centre reel will win you more free spins up to a maximum of 130. Treasures of Troy may not be the most state of the art slot we’ve ever played but it’s time well spent nonetheless; free spins are always welcome so if you like historically based slots this is well worth checking out.